Why use Pinterest Pinterest advertising? Pinterest is bringing in huge results for businesses that know how to use it well, with average increases of 20-30% in traffic and coverage. It’s no joke when you read headlines such as “$41,254.34 in sales made from $775 investment” on Pinterest blog posts. As a business user, you also have the option of running a competition, collaborating with other bloggers or popular Pinterest accounts though, so it’s important to be clear on your reasons for wanting to advertise specifically. 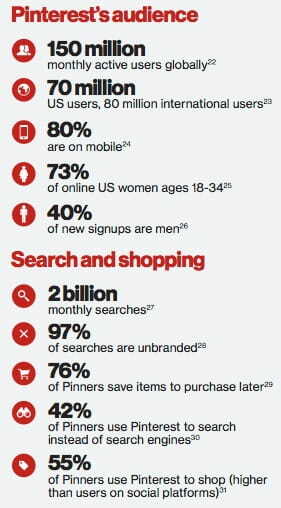 To understand whether your business can benefit read more about Pinterest demographics. Some key details are explained below to help. Pins last forever and are repinned frequently (80% of content is repinned content) so promoted pins are a great way of drawing attention to an individual product, special article or event. Once you understand the main objective of your business or team, and the main features of Pinterest discussed here, you’ll know if there’s serious ROI to gain from Pinterest advertising for your business. Think about how Pinterest users measure up with your target demographics before doing any bigger strategy work. We know there are now well over 150 million active Pinterest users, and that users grew 120% month on month during 2015. Pinterest also attracted 135% more users from outside the US the same year, so as a platform it’s definitely active and growing. Overall users are 85% female, only 6.6 million are male, and more than 42% of US users are female. Most Pinterest users are under 40 (62%) and more than 80% of millennials who use Pinterest use it to plan purchases they will make. Pinterest users are more often looking to buy or learn, not sign up to a cause or program, as they might on Twitter, Facebook or LinkedIn and spend on average $80 per purchase, twice as much as other platforms in many cases. That doesn’t mean you can’t direct users to a great article about your product or service, but conversions might not be as effortless as if you have an attractive e-commerce site ready to go, where users can click through and buy what they’ve seen or pinned to their own board and saved. Users buy to a theme; it could be weddings/events, interior design, fashion or food, but this can be anything visual – unique nail polish designs, animal products or a lifestyle product – like a car brand, health supplement or activewear. Pinterest is used for vision boarding, collecting ideas and getting inspiration for purchases. So where does your business fit into that blueprint? If you don’t offer a ready-to-ship (or buy), visual product, can you use images that represent the service you offer and create a desire to feel a certain way in potential customers? Before you do any promoted pins, you’ll need a business account. Sign up for a business Pinterest account on www.business.pinterest.com and click on ‘Join as a Business’ to use the features, or convert your personal account to a business one (you won’t lose any of your old pins by doing this). Fill out the details as in the second screenshot (should take 15 seconds) and you’ll be able to start pinning. Once you’ve confirmed your business your logo will appear on pins that are repinned, and you’ll have access to analytics for pins from your website, usually within 48 hours. When you’re ready to create ads, visit www.ads.pinterest.com and make sure you’re logged in. Click on the red ‘promote’ button in the corner, which takes you through to the 4-step process for creating a campaign. Choose whether you want to increase engagement, or conversions (visits to your website). This is THE most important decision in the process. Getting this right should make a successful campaign. Pinterest users literally tell you what they want, through what they pin to their boards. When you also use Pinterest analytics to promote and repurpose content that already gets traction organically or on Google, your ROI will increase. Create pins based on what competitors are using and what’s popular in general. It goes without saying that images need to be high quality and eye-catching on Pinterest, and descriptions need to be telling a story with more than just a list of hashtags. Blocks or tiles of four images and vertical lines do very well, with products and brands featured heavily within the image. You can look at examples from Pinterest ‘success stories’ and see exactly how successful businesses have used eye-catching images, and increased sales, via the success stories business page. On an iPhone grid, there should be about 4 lines of text when users view your promoted pins. On the iPad, it’s around 250 characters or 10 lines. The text shows up as truncated at around 3 or 4 lines, or 100 characters. Just like with Facebook, Pinterest users can refine the target audience based on age, gender, location – including city and/or region within the US, language, and device for displaying your ad. It has to be said that because Pinterest users are already focused on buying, and actively looking for inspiration, they’re more likely to respond to retargeting as well. Retargeted customers are 70% more likely to purchase, and there are multiple ways to get a customer’s interest the second time, through e-mail, serving up ads to similar content from your website, or creating new offers that you know will appeal. Using a digital marketing agency will help you do effective retargeting. Analytics – How will I know if my ads are performing? It’s ultimately for you to judge what’s a reasonable ROI for your spend on Pinterest ads, but you shouldn’t be disappointed if you’ve selected the right campaign objective in step 2 under ‘Ad setup for Pinterest’ above. Pinterest emphasizes keywords and interests, so do some research by using a tool such as AdWords, Keyword Planner or Keyword Spy. Generally, we recommend as many as 20 promoted pins. Pro tip: Pinterest now offers related terms, suggestions for other terms to include when you enter your keywords, so take advantage of it when setting up your ads. You can easily sort and filter the rows, and view up to 100 campaign rows at a time. To have any understanding of how well your promoted pins are performing, and to compare campaigns, pages or offers, you’ll need to create a conversion tracking tag. This is easily done, and a short piece of code just needs to be pasted into your website on the page you want to track. It can be tempting to just try running a competition or teaming up with bloggers and users who have a large following, but the costs of doing a competition can be high, and if you’ve done competitions on Facebook you’ll know it can be time-consuming, and results are not guaranteed. There are also rules and regulations you’ll have to keep in mind, and they might be different in each state or country where your business operates. Decide based on your ultimate goal, more conversions or more engagement? Promoted pins are easy to use, with tracking and results that make sense straight away and they are still very cost effective. CPC is generally cheaper on Pinterest than on other platforms. You can also create a blog post that includes an opt-in offer and pin to that, instead of directly to a landing page (still a no-no while Pinterest tries to keep the platform spam free). See this useful guide for more, but remember that promoted pins are done on Pinterest Ads now, not by hovering directly over the pin. 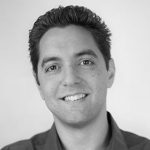 Pinterest uses a simple Cost Per Click (CPC) bidding system that usually works out cheap because you only pay what you would have to, to beat the next highest bidder. The biggest consideration is your ultimate goal – more engagement or conversions – and daily budget. Plenty of businesses see low costs per click get big returns, so it’s worth giving it a try. Statistics from the first part of this chapter are from Expanded Ramblings. I haven’t been using Pinterest much with my business advertising but I think I may be giving it a go now after reading this. You gave a lot of good information and advice here so I think I will give it a try and see how it works for me!